Christiane Knoop directs the adult CF clinic and the lung transplantation clinic at Erasme University Hospital in Brussels. In addition, she organizes the transition of adolescents with CF from the pediatric site Childrens’ University Hospital Reine Fabiola (HUDERF) to the adult site. Her main activity is clinical care. She supervises the out-patient and in-patient care for CF adolescents/adults as well as transplant patients. The patients of both clinics (CF and transplantation) participate in a number of national and international clinical research trials. 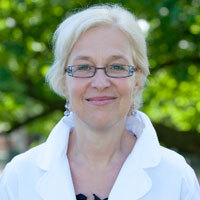 Christiane Knoop is a member of several scientific societies (European Cystic Fibrosis Society, Belgian Transplantation Society). She is also a member of the Medical Committee of the Belgian CF Association "Association Belge de la Lutte contre la Mucoviscidose (ABLM)", the Committee of the Belgian CF Registry, the Scientific Coucil of the Belgian CF Association and the Scientific Council of the French CF Association "Vaincre la Mucoviscidose" (since 2009).